1986 Electronic Engineering M.S. degree. (Faculty of Electronic Engineering, Niš , Yugoslavia) "Macromodeling and DC Simulation of Complex CMOS Circuits"
1990 Electronic Engineering Ph. D. degree. (Faculty of Electronic Engineering, Niš , Yugoslavia) "Macromodeling and Macroanalysis of CMOS LSI Electronic Circuits"
1996-2000 "Integrated Circuit Design Automation". 1994-1996 Subproject Leader "Design of Complex Microelectronic Devices". 1991-1995 "Development of System for IC Design and Verification". 1986-1990 "Semiconductor Microelectronics and Optoelectronics". Main areas: IC Design, ASIC Design, Design Automation, Circuit Analysis, Electronic Circuits Simulation and Optimization, Symbolic Circuit Analysis , Testing . "Alecsis" the first Yugoslav mixed-signal simulator, several designed and two fabricated integrated circuits prototypes . 2008-2010 An international research project realized within the Pact of Stability of Southeast Europe and funded by The German Government (DAAD) "ISSNBS"
2005-2008 An international research project realized within the Pact of Stability of Southeast Europe and funded by The German Government (DAAD) "ISSNB"
2000-2004 DAAD Program "Academic Rebuilding of South-Eastern Europe", project "ISSN"
1980-1981 Semiconductor Factory within Power Transistor Manufacturing group. 2001-... Full Professor at the Electronics Department of the Faculty of Electronic Engineering, University of Nis, Serbia&Montenegro (courses: Computer Aided Design, Integrated Circuits Design, Electronic Circuits Design, Simulation and Optimization of Electronic Circuits at postgraduate studies). 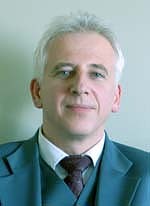 1996-2001 Associated Professor at the Electronics Department of the Faculty of Electronic Engineering, University of Nis, Yugoslavia (courses: Computer Aided Design, Integrated Circuits Design, Electronic Circuits Design and Simulation and Optimization of Electronic Circuits at postgraduate studies). Mentor for more than 40 diploma theses, three M.S. theses and one Ph.D. theses, reviewer of many M.S. and Ph.D. theses. Coauthor of two books used as recommended text books for courses Computer Aided Design, IC Design and Electronic Circuits Design at University of Nis , published in Serbian. Coauthor of six books that were/are recommended as additional literature (Problem Solvers, Laboratory Practicum) for courses Electronics I, Computer Aided Design, Electronic Circuits Design, IC Design, published in Serbian. Introduced and realized many new laboratory exercises for courses Electronics I, CAD, IC Design, and Electronic Circuits Design. Computer Aided Design of Electronic Circuits, Electronic Circuits Simulation and Optimization, ASIC Design, Symbolic Simulation , Testing . Russian: Able to read technical literature. Founder and the first president of Electrical Engineers Society, registered in FRY. First place at national competition "The best technology inovation in 2009" in category of Iinnovative ideas for Information-Communication Technologies. “Data security in distributed measurement systems”, funded within Program of scientific and technological cooperation between the Republic of Serbia and The Kingdom of Spain for the period 2012-2013.